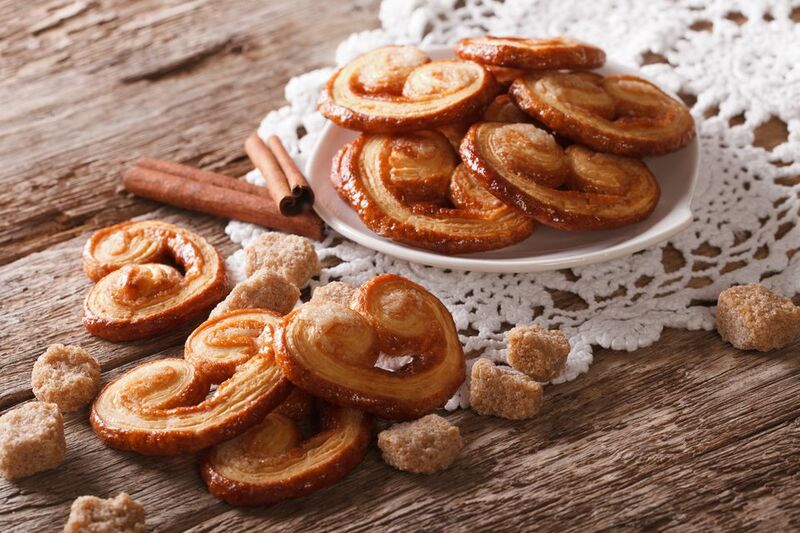 When one thinks of palmiers, the delightfully sweet, flaky cookies also known as elephant ears come to mind. These Palmiers cookies are all of that but also with a touch of caramelized cinnamon. You can whip up this cinnamon palmiers recipe ultra-fast, so they're perfect treats for last-minute gatherings or an untamed sweet tooth. The Palmiers are not unlike the flaky texture of a croissant but are in fact made with puff pastry. Though making puff is not so difficult, there are oodles of ready-made pastries out there and often it is quicker and easier (and puff pastry needs to be handled carefully so as not to flatten it), often it is easier to buy. Stir together the sugar, cinnamon, and melted butter until it forms a paste. Roll the pastry dough into a large rectangle, about 15-inches by 12-inches. Using a pastry brush or spoon, spread the cinnamon sugar paste in a thin, even layer over the dough. Starting at the long ends of the rectangle, loosely roll each side inward until they meet in the middle. To hold difficult pastry together, brush it with the egg if needed. Slice the pastry crosswise into 1/4-inch palmiers – they’ll look like little scrolls - and arrange them on a parchment-lined baking sheet. Bake them for 12 to 15 minutes, until they puff and turn golden brown. Remove them from the baking sheet and serve warm or at room temperature. This is a classic recipe and as such does not need changing or many alternatives., there are a few though which when used will not be changing the authentic nature of this lovely biscuit. Leave out the cinnamon, this is, after all, a matter of taste and this spice is not a favorite with everyone. Add another spice such as nutmeg, for a softer yet still spicy taste, try mace. Mace is the fibrous coating of the seed (the nutmeg) and tastes not unlike it but is softer and some say lovelier than the regular ground spice. If you can't find mace, use a tiny punch of pumpkin spice mix, but be careful or this could backfire and not taste too good.